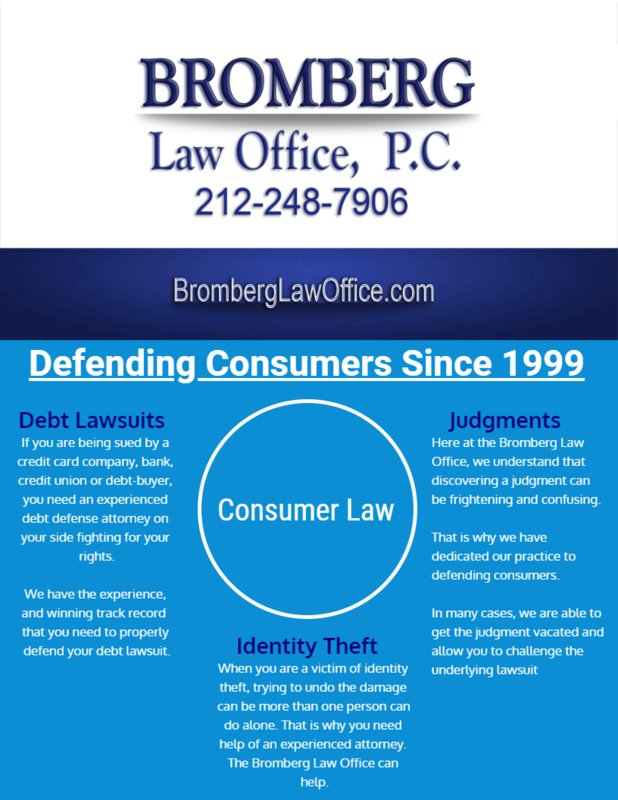 Here at the Bromberg Law Office, we’ve been defending consumers against businesses both large and small since 1999. Whether you are being sued or harassed over a debt, have a judgment against you, have had your identity stolen, are receiving annoying robocalls, have errors on your credit report, or have been the victim of auto fraud, we can help. We have the knowledge and experience you need to fight back against unscrupulous businesses and debt collectors. It’s extremely important to have experienced representation on your side, that is focused on consumer issues. All we handle are consumer cases. That means you will have the full attention of our office fighting for you. Don’t sell yourself short, by settling for a law firm that doesn’t focus on consumer issues. Let our expertise in consumer law help you resolve your legal issues. Call us at 212-248-7906 for a free consultation or fill out the contact form below.